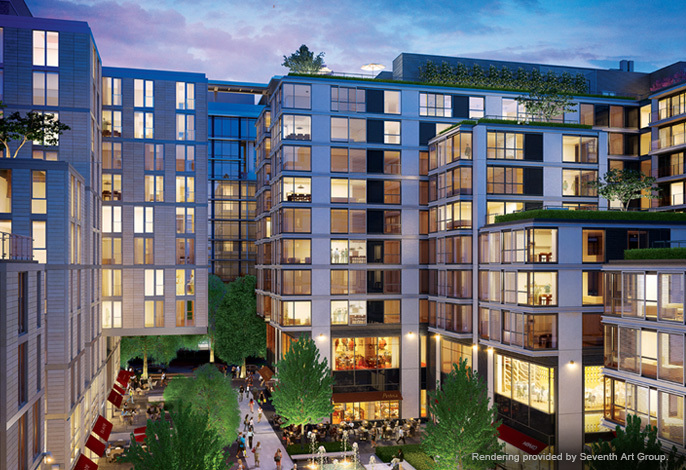 Located on the site of the old Convention Center, CityCenter DC is a mixed use development project located in the heart of Washington, DC. This site is bordered by New York Avenue and H Street (north and south) and 9th & 11th Street (east and west). The development plan include 520,000 sq ft of office space, 674 luxury housing units, 270,000 sq ft of retail, approx 2,000 parking spaces overall, and close to an acre of open space. The first phase of this project is essentially the housing units (460 apartments and 216 condominiums) which is scheduled to be delivered in December of 2013. 92 units will be designated for affordable housing (60-80 percent AMI). All of the condominiums will offer "access to a balcony or Juliet balcony. Eleven of the homes will a true rarity, the exclusive use of private terraces. It is anticipated that sales of units will commence in the Fall of 2012 with the opening of the Sales Center." There is a tentative agreement for Houston based Covington & Burling LLP to occupy 420,000 sq ft of office space. Del Frisco's, a Dallas based steakhouse is in the process of finalizing a lease to occupy 17,000 sq ft of retail space. The second phase of the this development project will be a 374 room luxury hotel scheduled to open in 2016. CityCenter DC is Pre-Certified LEED Gold Core & Shell.